Royal Canadian Regiment, 7th Brigade, 3rd Canadian Division, C.E.F. 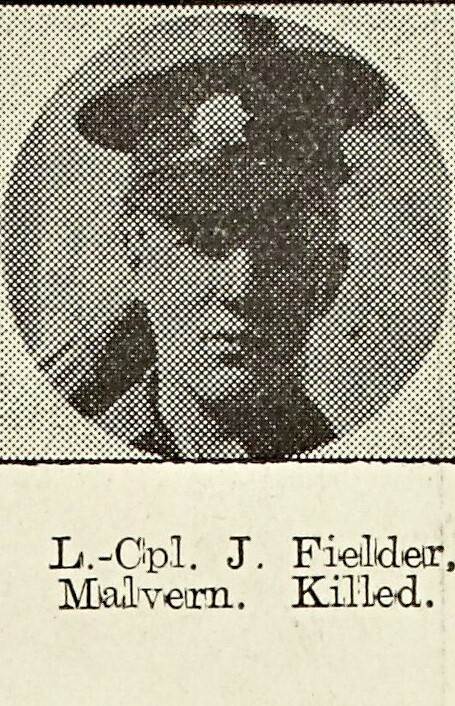 In May 1917 the news reached Malvern that L/Cpl J Fielder of the Royal Canadian Regiment who was reported missing on the 8/10/16 was killed on that date. He was 19 and the grandson of the late Mr and Mrs W Hayes and nephew of Mrs Baker with whom he lived for some years at Scarborough House, North Malvern Road. Another grandson of Mr and Mrs was also killed during the Great War. Born in Brighton, 30 year-old Lieutenant Bertram Hayes Fielder, 7th Infantry Battalion, 1st Canadian Division was killed in action on the 27th September 1918; strangely he is not commemorated on the Malvern Library Memorial. He was the son of William and Emily Eliza Fielder, of 521, Wilson St., Victoria West, British Columbia, Canada. He is buried at Sains-Les-Marquion which was captured by the 1st Canadian Division on the 27th September, 1918.